I have never been to West Virginia before. I have never seen the rolling hills or driven the winding roads dotted with mines. Mines are the lifeline of this area and there is one around every corner. Everyone has some connection to mining. The people here are risking their lives everyday in the mines to make sure we can turn on the power in our homes. Whether you like it or not, coal is a big part of our country’s power system. And there’s a lot you can learn from the people in these coal mining communities. These are men who work long hours to feed their families. But they are also men who believe in God and go to church on Sundays. They are families who pray together every Sunday morning and still gather as a family for Sunday dinner. The instant they heard of an explosion at the Upper Big Branch mine the people of Southern West Virginia started a prayer chain. And within hours there was food for families who gathered together awaiting any word about the fate of their loved ones. There was even food for the media who came to cover the story. I learned this week that there is an old coal mining tradition that when men come home to their families, covered in soot from the day, they always make sure their lunch buckets have a special treat for the kids. Children across coal country are excited to find out what their dads have brought them after a long day of work. And that is why these men venture into the mines everyday – to make sure their kids are taken care of. Sometimes I think that the rest of the country has lost track of these values – the values of family and community. I barely know my neighbors. And the people here could tell you who just about everyone in their town is. 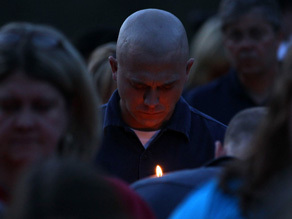 When they held a vigil last night in Whitesville, West Virginia dozens of people came to walk the streets with candles in memory of the men that died in the mine. One miner brought his family an hour and 45 minutes, still covered in soot from a long day’s work, to honor his fallen comrades. While these coal mining towns in West Virginia pray for the four miners they hope are still alive and bury 25 of their friends and family, let’s take a moment out of our lives to remember what they have taught me is truly important – friends and family. Lesson? Republican lawmaker protected corrupt Corporations are above the laws and immune from prosecution as a matter of business. Normally when Methane Gas levels rise the Methane Gas sensors AUTOMATICALLY shut down the coal grinding equipment on the wall surface which should immediately begin lowering that Methane Gas level. The Automatic Shut-Off Sensors do this WELL BELOW any level of Methane Gas which could combust or explode. Lesson? IF the Methane Gas production equipment sensors were bypassed to keep the coal production wall surfacing machinery running in higher than acceptable Methane Gas levels then Manslaughter Charges should be handed out by US Justice. WERE THOSE SENSORS BYPASSED BY MASSEY ENERGY SUPERVISORS under MANAGEMENT ORDERS? 1) Putting at risk or risking one’s own life in the line of work does not imply or denote Christian Morality or lifestyle. 3) Bottom line, it seems to me that you are asking people to remember and appreciate these people lives, sacrifices and deaths. And to join their self-righteous prayers which are indifferent to the word of God. We learned that corporations can buy Republican lawmakers so that true reform in Mining does not take place. We have learned yet again, that it is the hard-working people that end up dying because the wealthy mine owners with their millions, can buy off Republican lawmakers in red states like W. Virginia. God bless the Miners, their families & the rescue workers.... but...... also the Union leaders who fight for Mine safety! As a Christian, a West Virginian, and a Republican, I am thoroughly disgusted by the comments above. For the information of the writers, WV has a Democratic governor (whom I have nothing but respect and admiration for) and both houses of the legislature have been controlled by Democrats for years. Therefore, you have no grounds to blame the Republicans. I have no clue why Joe says that going to church on Sundays is an indicator that one does not believe in God. God could not care less when you go to church. He cares that you go! No one at this time knows what caused this tragedy, and finding that out is appropriately #3 on the priority list behind completing the rescue and recovery operation and helping the families in their time of need. Maybe someone did something wrong, maybe not. Maybe there was a surge of methane from the seam that happened so quickly that nothing could have prevented this. Let's wait until we have some facts before we start condemning people!! @Joe G.Illinois....your attitude & your opinion is part of the reason why society is the mess it is. Instead of adding your pompous statements ,could you not have commented with a little empathy for the miners & their families. All they are doing is trying to feed & support their families. Your comment #2 made absoloutely no sense. If you want you could explain then maybe I could understand. I don't know who you think you are......I hope you take a very long look in the mirror & see what an unkind man looks like!!!! I can't believe the people who are commenting on this story about the close-knit mining communities for the sole purpose of throwing their miscellaneous political, environmental, or religious views out there. This is a story about grieving human beings coming together in a time of tragedy–something that many of us have evidently forgotten how to do unless the event directly affects us. It's a real shame. We should be focused on offering these people our support and best wishes, not using this saddening event as an excuse to bicker over who's right and who's wrong. Maybe you should just offer your condolences and save the political and religious debate for a better forum. If it were your son who had been killed in the mines, you wouldn't want a bunch of people standing by commenting how his religious beliefs were wrong or his job was killing the environment or his bosses were corrupt. These men are dead. Try showing some respect, why don't you? My deepest sympathies to everyone in West Virginia who has been affected by this tragedy. I hope that God heals your hearts. I am 34 years old and my Daddy has been a coal miner all of my life. He was in the explosion on Monday and survived. I would like to thank you, Andrea Beaumont, for writing this. This story conveys the WV that outsiders could not begin to understand. So many emotions came to me when I read what you wrote about coal miners tradition. I remember vividly as a child my Daddy bringing home SugarBabies and SugarDaddies. I remember attempting to hide in his laundry bag so that I could go to work with him. I grew up in Rochester, NY but attended college at WVU. I got to see a completely different side of America. It's the attitute, determination, and compassion that West Virginians have that helped build this country. There are few people like this left in this country... and most of them live there. This is why, while I grew up in NY, I'm proud to call myself a Mountaineer. I would also like to thank those miners... some I know personally... for keeping my lights on. I am from West Virginia. I was born and raised here. My grandfather owned one of the biggest coal seams from where I am from, so you can see I come from a coal mining family. He worked in that mine as well til he was able to retire. My father-in-law is a coal miner and has been all his life. My fiance is in the process of getting his 80 hour card so that he can go underground. My fiance's grandmother was the first certified woman to go underground in this state. Mining is our bread and butter. It is all we have and even our women can do it. If you don't live in West Virginia then you have no right to impose your beliefs on us. Just because we go to church on Sundays doesn't mean we are not Christians. We are not asking anyone to put us on a pedestal for the the jobs we hold. We ask nothing but the support and your prayers for 25 possibly 29 grieving families in this community. All this blog was implying was that our small town value system has been forgotten by most of the world. It did not ask for your criticism or your thoughts on our political views. God bless the miner's families and all the miner's in this beautiful state for what they do! In West Virginia, tradition dictates political and social action. "Power corrupts and absolute power corrupts absolutely". We wait faithfully for a scrap of honest news, while at the same time we have the supreme leader of our state PLAYING go-between from the family to the company to the networks. With my thoughts and prayers going out to the families, a tapestry of travesties unfolds before our very eyes with nothing more than lip-service going out to the multimedia global community. Gov. Joe Manchin III of West Virginia said Wednesday that he was concerned about reports of several work stoppages in the mine before the explosion because of high methane levels. The mine is supposed to be outfitted with air-quality sensors that shut machines off when methane levels grow too high. After their initial ventures into the mine, rescue workers said the explosion appeared to have occurred in its active section, not in the abandoned, sealed-off areas. If the sensors are not illegally BYPASSED the equipment automatically shuts down the active section in that Massey Energy Coal Mine. It wasn't until the Democrats regained control in the US Congress that the 2006 mining safety rules included mandatory Emergency Safety Chambers and Emergency communication devices along with tracking locators for the mining workers underground. Historically Republican led lawmakers strip and gut the funding for many essential US Governmental agency's, leading to far fewer employees and far fewer regulations inspections. The horrific Bush-Cheney Republican administration was no different in gutting the Federal Mining Safety agency. If you recall Republicans led by Bush-Cheney did the same to the FDA food inspectors also which resulted in thousands of people sickened by e.coli bacteria laced food and pet food laced with poisonous plastic chemicals which killed hundreds of domestic pets. Why does it matter what the Republicans did or the what the democrats are doing? Your thoughts should be focused on these families and their loved ones that they lost, not on the politics. @A. Smith The equipment was not running because it was shift change. They did have CO2 monitors at this mine at places that are required to be placed. At this time NO ONE knows why this horrific event has happened. Please leave it alone. I read this story that was wonderfully written and it took me back to my childhood. My father worked very hard to give me and my brother a wonderful childhood and paying for my college education. This was not a story written to bring up things as you have written. You have no right to judge people you know nothing about! These families need our prayers and support. Not people critisizing what they do or why they do. Just remember when you turn on your lights your tv and all the things you should be fortunate to have, where does the power come from? A.White congrats i'm glad your daddy survived and god does my heart ache for everyone around here that lost a love one this is so sad i just pray that god brings us another miracle well shall i say four miracles i'm not losing my faith i know that god here's are prayers, this hit's home for everyone around here because every one know's a coalminer, Joe. i will pray for you i guess you don't know what it is like to live where people actually care and love eachother and your neighbors are like family, but i'm not gonna argue with anyone this is not what this blog was ment for, it was ment to show how we live in WV and still hold true to our traditions. I'm proud to be a west virginian, i'm proud to be a granddaughter of a coalminer who worked very hard to make sure that his family had what we needed i watched that man get up and leave every morning at 3:30 and not get home untill around 4:00 but he never complained he would always come home with a smile and i remeber thats all you could see was his white teeth and the white of his eyes lol...we was covered from head to toe with coal dirt it takes a strong person to goes miles underground for a living i have the up most respect for all the coal miner's of the world god bless you and your family. I'm so proud to raise my family in wv i'm not sayin that there is not a better place i'm just glad that my kids will experince what it is like to be raised where family and your community or everything and you never leave anyone behind and you learn about god and what true respect is. I would like to say thank everyone for there prayers and positive thoughts on WV and our miner's may god bless you. Down in the mines the coal to seek. In dark and damp we have to toil. By strength of mind and back of hand. To work as miners dayby day. And face the rigors of a miners life. Now high above in the light of sun. A child at play enjoys his fun. That the mines will claim his dad so dear. And send them safely to the ones we love. And we must pay the price at last. Yes, a time of grieving and prayers for the family's of those lost men and for those not yet rescued. Pray hard! Rescue teams should b @ first chamber sometime around 2am. Thank you Brittany. It is 2:18am and I have to be up for work at 7 but I still have hope and can not go to bed until there is word. I pray my Dad's best friend is brought out alive to his wife and children along with the other three missing men. My thoughts and prayers are with the families of this horrible tragedy. Miners are a special people...they work harder that just about any profession I can think of. My great grandfather worked the mines his whole life...and what a long adventurous life he lived! I hope the miners still trapped will be freed to continue on their journey with their loved ones. God be with them. Thank you Ms. Beaumont! You seem to have understood and captured the WV spirit in your writing. God Bless you–and come back to visit any time! Ms. Beaumont – Thank you for your comments. I think they are very accurate. Most of the miners that I know are very uncomplicated, hard working people that make great neighbors. I agree with many of the above comments and I think they reflect the distance that has always, and still does exist between owners and workers. Don Blankenship made $26M in 2008 (if memory serves from a newspaper article). I'd love for someone to ask him about the last time that he was at the face of the UBB mine. I'll bet the methane detectors worked that day,if there was one. Some of the most fatal crimes of our history have been the result of actions taken in corporate board rooms. Mesothelioma certainly comes to mind. I often ask myself how integrity can be created in the power brokers of our country. I am without an answer, but I think that is a critical test of our society. It is one that we are currently failing, but I still hold hope. My hat is off to the Bill Gateses and the Warren Buffetts of the world. Somehow, they seem to have retained a conscience in spite of immense wealth. My heart aches for the miners at UBB and their families. They are in my prayers. People please, while we are eager to find out all that happened to our miners in the hole right now, and ready to bring our last four home, it is not time to play the blame game.. I am VERY proud to be from Whitesville WV and I was very proud to stand hand and hand with all my coal family and pray for our men. We need to give these families time to grieve and for all the families to find out who exactly is in there. Please dont start pointing fingers yet and playing the blame game, we need prayer more than anything right now.. This should be a lesson to those who fight the atomic power, because it is too dangerous. How many miners died over the years in mine accidents, lungs full of dust and countless other illnesses caused by the dust they inhale every day and the hard work they must do. It is imperative that we work on a safe atomic power, because the wind, water and solar energy is a great addition, however they just cannot supply enough currant for an industrial nation. Other natural resources such as coal, gas and oil will be depleated before long and are too valuable just to burn. Oil is the base for all plastics and many medicinal creams and ointments. to overseas markets. Typically too deep for strip or mt.top removal. Some of your comments are uncalled for and flat out stupid. You should be ashamed of yourselves for what you say. You're freedom of speech should be taken from you. These families and communities are what were discussed in the article, not the lawmakers. The writer is right, it is very important to realize what is most important in life, relationships. You all typing these comments wouldn't be able to if it weren't for coal miners providing power for your computers. Thank you for the beautiful article. The comments made by others which you reference are very typical on LKL. Lacrosse Mom knows nothing of the politicians in WV. I am aware that your governor and senators are Democrats so have no idea why A. Smith, Mom and others post such comments other than the fact that they post on every topic comments that are negative toward Republicans, even when the topic is far removed from politics. I am neither a Republican nor a Democrat but it does get a little ridiculous. You just have to ignore it. Many have left the blog because of the novels posted that obviously came from those obsessed with whatever. My heart goes out to the families in WV who are suffering as a result of this disaster. I just returned from a candle light vigil in honor of our fallen miners and we lit candles of hope for the four unaccounted for. My dad was a coal miner and yes I can remember the treats he would bring home in his lunch box. My dad was proud to be a miner and had a special bond with his fellow miners. A bond that many cannot relate to. My dad was also a determined man. He was determined that I get a college education and he made many sacrifices so I could. He was blessed with four grandsons all of which he left money so they could also go to college and not work in the coal mines. Im proud to be from West Virginia! More people die on U.S. roads (mostly above ground) than in coal mines each year. Yes, mining has its risks, but it also provides you all with the electricity to log onto this website (either via computer, or charging your phone) and complain about how "godless" and "dumb" we are for working in such a courageous job. Instead of being critical, get down on your knees and pray for these miners, their families, and their communities. God blesses us everyday beyond what we deserve! You don't know how long you have – a car crash could await you tomorrow. West Virginia a republican state? SERIOUSLY?? I grew up in WV, and it was anything but republican. I guess it got that label for not hopping on the Obama band wagon. Regardless, this is NOT the time nor the place to discuss religious or political issues. This is a time to offer support to families who have lost someone who was supporting them the only way they knew how. This disgusting attitude that these poster have is shameful. Let me enlighten those who THINK they are the enlightened ones. The fact that you used this forum, at this time, for political and religious mockery proves beyond a shadow of a doubt that you are anything but enlightened. You are so caught-up in your worthless causes that you cannot see that something happened that is bigger than your agenda. People were killed... not by mining coal, or destroying the environment. They were killed supporting their families. If you cannot give your political BS a break long enough for them to bury their loved ones, you are not worth the minimal brain power used to generate such garbage. Someone always has to add their negative comments!!!!! Would agree with what you have said. For goodness sake have some respect for these people. Their lives are at stake this very moment and every day and all what some of you can do, is go on about politics. As if it is the be all and end all of everything. Sorry to hear about this tragedy and condolences to the families and friends who have lost loved ones in this. May God comfort you all at this sad time and our prayers are with you. What we can all learn from West Virginia is how these coalmining communities stick together and support one another. They are a special breed these miners and God bless them all and keep them safe in their dangerous jobs. The safety standards is another thing. What were the safety standards like and what went wrong? Could measures have been taken to avoid this type of disaster? I'm a coal miners daughter from WV. MY dad always brought home his cake treat for us kids to share! No wonder I'm such a sweet tooth...PS I have more than one tooth! 🙂 God rest his soul and all the coal miners! My dad died @ 67 years old with infection in his lungs that had been collapsed for years with a drain! He always wanted to have a autopsy for Black lung.....the Hospital report in Morgantown said, "No sigh of Black Lung".....I think the Hospitals were paid off by the Coal Companies! Thoughts and Prayers go out to the miner's families and friends. May God comfort you in this time of grieving, and grant you comfort in the days ahead. Everyone could learn from the good people of WV, hard working and honest, God-fearing people. I am proud to say I am from WV and God grant that one day I am able to move back there to live. Thank you Mr. King for your very kind, corforting words. Many outside individuals have a very dismal view of Southern West Virginia. You seem to have seen through the dust and fog and recognized the truth and beauty here. We are honored by your future and past visits. I am truly saddened by the tragedy that has taken place in our beautiful state but more upset by the negativity others have displayed by the accident. I hope and pray for all the families that have lost a loved one. I am a proud to say I was born and raised in West Virginia. I too come from a family of coal miners and my grandfather lost a brother and nephew in a accident in Jan of 1951 in Kermit, WV. My grandfather went to work in that mines a couple of days later. Our state revenue comes mostly from coal and so does the majority of the electricity in the United States. I think that says alot for our state that these men and women return to these jobs daily not thinking of themselves but their families and loved ones. Our state has many wonderful people and I am proud to be part of it. Thank You!! I am apalled at the comments these non resident's of our state make during this tragic time. It is my opinion that if you do not reside or pay taxes in West Virginia your opinion does not matter and you should really not concern yourself with the specifics of coal mining. This is our way of life and many families are fed by coal. You just don't understand the people and our traditions. Coal miners realize the risks that they take everytime they go in for their shift, but continually do so to provide for their dependents. If they are willing to take these risks then it is none of anyone else's business. I'm proud to be a West Virginian and more so a coal miner's wife. People like joe from chicago is part of the reason us west virginians stick together, we don't need that kind of negativity in our community. These are the same ignorant people that believe those stereotypical movies are true.